It’s been a while since we had a nice brown bread on our table. Wouldn’t it be nice to make a Brown Essential Columbia. This country French-style bread is named for the Columbia River. It’s a beautiful river like our river Mae Kok here in the North of Thailand. We’re lucky to have a river near our village. Beside all obvious reasons for having a river, water also helps with the fun we all have during Songkran; Thai New Year. It's very hot during these days; more than 35C (95F). In the street people throw water at each other. It’s a very old tradition to visit and pay respect to elders (family, friends, neighbors and monks) during these three days. And at the river banks the locals build bamboo restaurants and they rent out big tubes to play in the water. From the south many come to visit their family and play in the river. It’s a happy celebration all over the country. But, especially in the North of Thailand. Of course it's also time to bake a bread, despite the heat. The delicious bread I choose comes from Maggie Glezer's book "Artisan Baking". This is a absolutly delicious loaf of bread. There are a few on my list of favorites; Norwich Sourdough, Tartine Country Bread, Ciabatta. And now this Essential’s Columbia is on there too. I’ve baked it a few times before, but today I wanted to bake a brown bread. 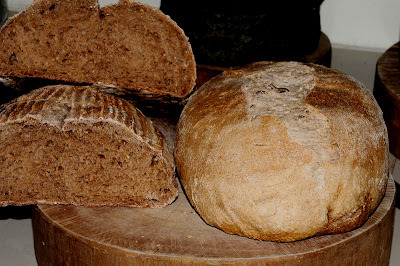 Just add a little bit of roasted malt and you have a nice brown bread. The other thing I changed was honey in stead of non-diastatic barley malt syrup. I found this recipe also in Dutch at Levine’s Uit de keuken van Levine. First refresh your 100% hydration starter to make a firm starter. After the starter is fully activated you can make the firm starter. Take 45 g of an active wet (100% hydration) starter and mix this with 70 g water. After it’s mixed enough add 160 g flour, this will add up to 275 g of levain. Cover and leave to ferment for 8 – 12 hours. Dissolve starter in the water, then add flour and knead this stiff dough until smooth. Place in covered container and leave to ferment at room temperature until it doubles, 8-12 hrs. Combine all flours, roasted malt, diastatic malt and wheat germ in the mixer bowl. Add the water and knead untill all is combined. Cover and leave to rest (autolyse) for 20-30 minutes. Add the levain and salt and knead in mixer at low speed for about 4-5 minutes until very smooth. The dough should feel smooth, dry and firm at end of kneading. Transfer the dough to a lightly oiled bowl, cover and leave to ferment for 3 to 5 hours. After 1 hour gently stretch and fold once to give the dough more strength. Place the dough on your floured work counter. Lightly round the 2 pieces or 1 big piece into boules. Cover with plastic and let rest for 10-15 min. to relax the gluten. Very gently shape each boule into batards. Place the batards seam-side down into a linen floured couche. Place the batards in a plastic bag and proof for 3.5 to 4.5 hours at room temp. At least 45 minutes before dough is fully-proofed, preheat oven with baking stone and cakepan with stones for steaming to 220°C. Gently place the loaves on parchment on a peel. Slash the batards with a razor or lame. Slide parchment onto hot baking stone in oven and quickly pour 200 ml of boiling water on the hot stones and shut the oven door. Bake for 15 minutes with steam and take out the cake pan with hot stones and remove the parchement paper and rotate the loaves. Bake another 15 minutes without steam or as long as your oven need to get a nice dark brown color. Cool on a wire rack before enjoying this delicious smelling and tasting bread. I baked a big one and baked it in my ceramic pot, it looks nice don't you think? New Year was great! like this loaf. Thanks Heather. This looks very much like the recipe for Essential's Columbia from Maggie Glezer's Book 'Artisan Baking'. Have the book, haven't tried it yet but your pictures have got me thinking I need to very soon ! D, this is the recipe for the Essential's Columbia. Don't think too much with this one, just go for it and bake it. It's delicious.